A mobile dog training business has sniffed out a brick-and-mortar location. Canis Major Dog Training will open next month at 601 N. Bryant St. in Sun Valley, after two years of training dogs in clients’ homes. The 7,600-square-foot facility will allow the business to expand its training services, according to Usra Acree and Kimberly McRae, who founded the business in April 2016. “We’ve always wanted to open a brick-and-mortar, but it took us a long time to find something that fits our needs,” Acree said. The facility features a 3,500-square-foot warehouse space the business calls its “gym.” A portion of the space will serve as a kennel area, and the front of the building will have two private consultation offices, a lobby with retail options and a kids’ play area. 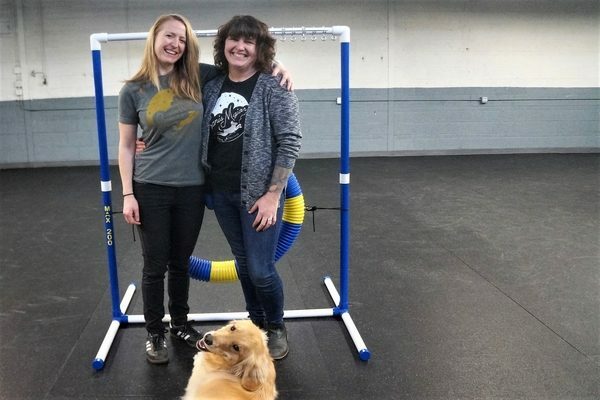 In addition to private training, in which a trainer works with a dog one on one, Canis Major will now offer group classes and “puppy socials” — both of which are designed for an owner to stay and participate — as well as two additional programs in which dog owners drop off their dogs to be trained. These two programs operate similarly to other dog day care and boarding programs, but with the spotlight on training, the pair said. Acree and McRae are both from Louisville, Kentucky, and met in 2007 at the Kentucky Humane Society, where Acree was working as behavior manager and McRae was a volunteer. Acree moved to Denver in 2010 to work as behavior manager for the Dumb Friends League. Five years later, she convinced McRae to quit her job in software development, move to Colorado and start a dog training business. Acree has been training dogs since 2001, she said. Before securing the facility, McRae also worked as training and behavior coordinator at the Humane Society of Boulder Valley, but now both founders are working on the business full time. They said a cornerstone of the business is a training guideline called the “least intrusive, minimally aversive” philosophy. This involves seeing if the dog’s physical needs are being met — if the dog is in pain or has underlying medical issues, this could be the cause of the bad behavior, she said. Acree and McRae were the first certified “fear-free” trainers in Colorado, they said. They say this method allows dogs to choose to participate in their training and care rather than be forced. To provide this personalized attention, the business never will have more than seven dogs in the facility at any given time, McRae said. With the move to a brick-and-mortar, Canis Major now has a staff of seven. There will be four trainers, including Acree and McRae, who said all are certified by nationally accredited organizations. The pair said the business has been profitable since its beginning. The price of private training won’t change at $100 for an hour of obedience and behavior coaching. Day training costs $119 per day, and Board & Train services start at $1,199 per week. Thirty-minute “puppy socials,” designed to socialize dogs under 18 months, cost $9, and group classes go for $149. 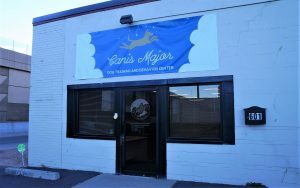 Canis Major still will offer in-home training within an eight-mile radius and for a travel fee of $30. The business is offering limited services before its Jan. 15 hard opening.